Today I'm blogging about my sister homemade Pandan Layer , that is so excellent and most beautiful about this cake about it . 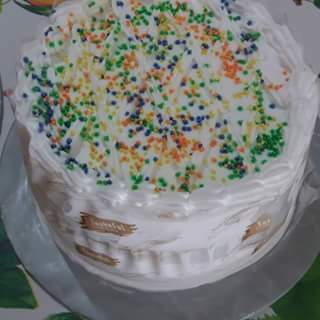 Actually my sister have a talent to make cake with many type about it at home about it , she homemade cake always looking delicious and also will be make mouthwatering about it too . 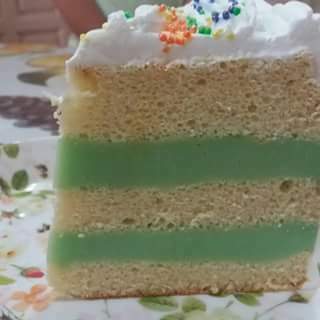 But this time she make pandan layer cake about it and I'm see it that so excellent with decoration about this homemade layer cake , she looking creative too how make this beautiful cake and different then outside cake shop . About me also like this pandan layer pandan cake because that no sweetest and fragrance with a pandan about it . So no wonder why many customer will be booking my sister homemade cake , because that looking delicious about it . I'm honour too with my sister because she is a talent cake maker about it , many customer booking she cake for birthday and anniversary it . Whatever I'm is a lifestyle blogger always support with my sister about it , so who want living near there can find her to booking her homemade cake . That also never disappointed to try my sister homemade cake and will be back to order it again . Actually in this world have many amazing of phenomenon about it , got one phenomenon always people want to see it . 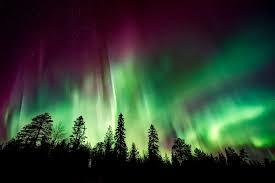 That is Northern Lights or also as known Aurora Borealis about it , normally that display many colour like a Rainbow but that is shooting rays that light up the sky with an eerie glow about it . Actually that is also between gaseous particles in the earth atmosphere with charged particles released from the sun atmosphere , many place in north can be see this phenomenon about it . Whatever the best place to see this phenomenon is a northwestern of part Canada , Norway , Greenland , Iceland and Alaska . That is also good season to view when Winter in the north , because this long periods of darkness and easy to see auroral display when frequency of clear night . So this area north in smaller communities with tend to be best , when got a chance to see this phenomenon . 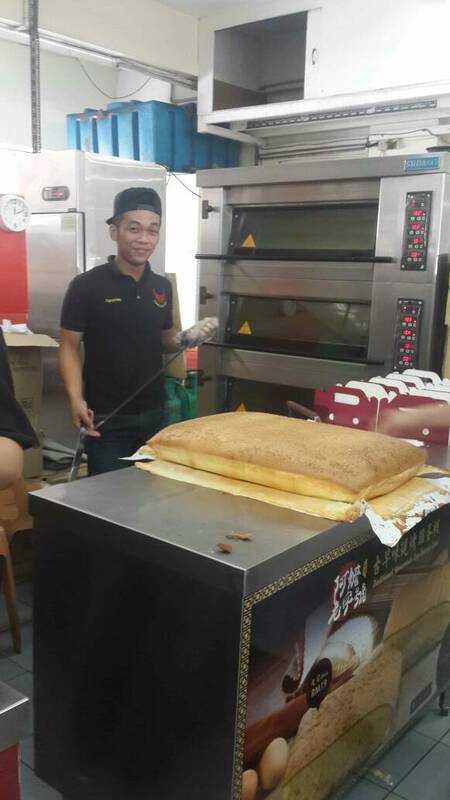 Today just visit JW's Corner , Damai Plaza Phase 4 and try their homemade sponge cake , that is looking so delicious about it . 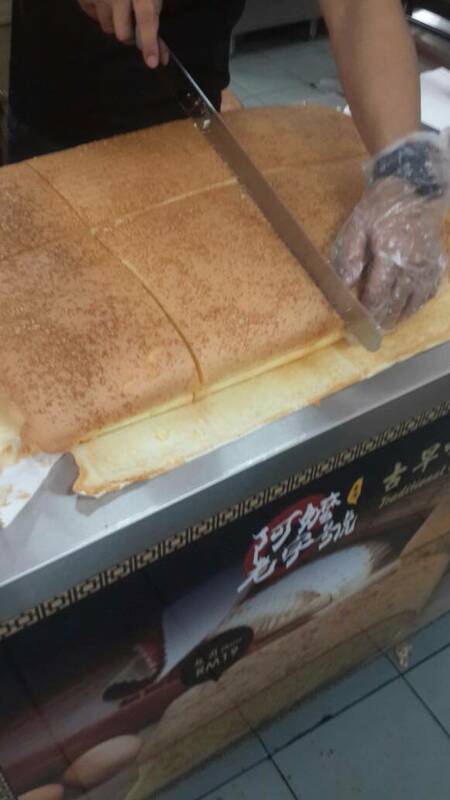 This sponge cake got many flavours and excellent it , about it also got promotion today with buy one free one about it . So many people start to waiting about this promotion will be start 12 noon onwards , so who like to eat cake must be try this excellent homemade sponge cake . I'm and my wife also get try testing this sponge cake and looking delicious with fragrance it , that also so smooth about this sponge cake . This sponge cake also looking not sweetest about it and nice to eat for breakfast or tea break about it . Actually just only today got promotion about this homade sponge cake about it , no matter this is excellent homemade sponge cake must be got to try it . About JW's Corner will be business operation everyday from 07.00 am until 10.30 pm , so who living near at there can be visit it too . Actually this sponge cake not too expensive , so never disappointed to buy it and bring back to home with family enjoy eat this homemade sponge cake . My wife choose Pandan Sponge Cake , because only this got promotion for buy one free one about it , about another flavours don't have promo it . I'm also don't know why , but whatever can try this delicious sponge cake . Normally another flavours is Chocolate Sponge Cake and Chicken Floss Sponge Cake , but that both don't have promotion , just only Pandan Sponge Cake about it . Now many place already start with big sales for end of the year , so many people will be to shopping at anywhere about it . 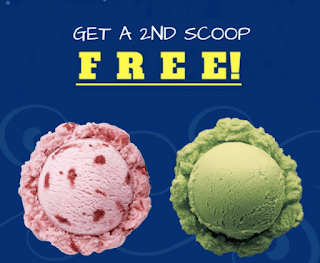 But whatever who is a ice-cream lover will be get good news for them , now Haagen Dazs Malaysia is having their ice cream promotion with buy one free one about it , so this time for enjoy yourself with this ice cream brands . That if buy one scoop will be get another scoop about it and absolutely free when you flash your Bonuslink Virtual Card and many more about it . Today our both will be back to Sabah , so got to they fast food franchise in Incheon International Airport , that is must be Burger King . What different about this franchise about it ? 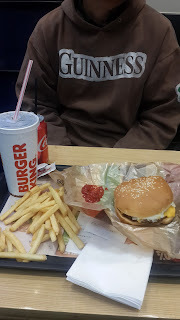 That is burger looking bit huge and also looking delicious with Pamesran Cheese about it , that also many onion , tomato slices and excellent beef meat . This also with smooth burger bun about it so that different about it too , so many people will be like this burger it . About that price for this burger only just 6500 Won , so can be say not expensive about it . If want order one set with include drink and french fries just only 9500 Won , so must be try this burger about it and will be feel how different it . About my wife share this burger with me because that bit huge can be two people eat this burger , so this also can be saved cost for it . Whatever I'm be give thumb up for this fast food in this Burger King franchise at South Korea . Actually many Korean people also like this with take meal at there or just be take away about it , whatever when one day our both to visit this country again and must be try this burger again with how different it . Here already falling snow about at here , that is first snow in South Korea , that is more chilled during night and day . Whatever I'm so lucky can see falling snow that first time in my life , so this good memories when travel at here . Whatever maybe next year will be visit South Korea again , but this week I'm and my wife will be back to Sabah , so hope next year can be visit here again . about for me will be rated five star for this country because clean it and most beautiful place about it , so that never disappointed to visit here . That is too looking nice when can touch snow at here and that is first time too , actually this snow is looking smooth like our drink " ice blended " about it . I'm also want try to make snowman about it , everytime watching television or movies about people to make snowman during winter about it , so that can keep more experience in this winter season . Actually I'm also visit this workers quarters at here . many people say that so cold and hard to work about it , sometimes also got people back to them country because so cold and can't be stay too long at here . Another is about many farm will be closed temporary when during snow it , so already few job at farm and will be back early to they country it . So must be ready Snow Jacket about it and can warm that body and less feel cold about it , I'm also go wear it because I'm afraid about cold it and quick to falling sick too . Are you like to eat bun ? 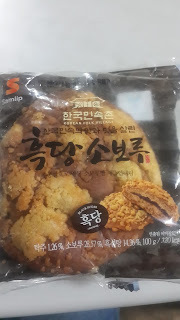 Whatever I'm intro this Korean Bun at here , normally this bun is looking so delicious about it and my wife buy it near bread shop at here . This bun inside got Black Sugar about it and also bit crispy about this bun , but this looking not sweetest too , so nice for breakfast or teatime . About that plastic got a brand is named Korean Folk Village , I'm think this bun maybe is a culture Korean people food too , actually got many type again about this bun . When I'm eat this bun and can be taste how fragrance about black sugar inside this bun , so this bun can be give thumb up too . About this bun only 1000 Won so that can say is cheaper it , this also can be keep for supper during midnight about it . Actually now is Winter at here , so nice be keep this for supper too because chilled is more hungry about it . Normally this bun got must be to try about it , that is not sweetest and fragrance with a black sugar about it . So our also will be to buy this bun and bring back to Sabah . When during time feeling unwell , I'm just taking dinner with my wife only Korean Ramen , that is looking delicious about it too . 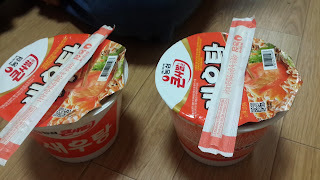 That second time our both taking this korea noodle and our cook two pack about this Korea Ramen , that is different then another noodle it , this ramen our take with a pack and before this time just only a Korean Noodle Cup about it . When this already try it and will be want again to try it about this ramen , so that don't be feel disappointed about with this meal . 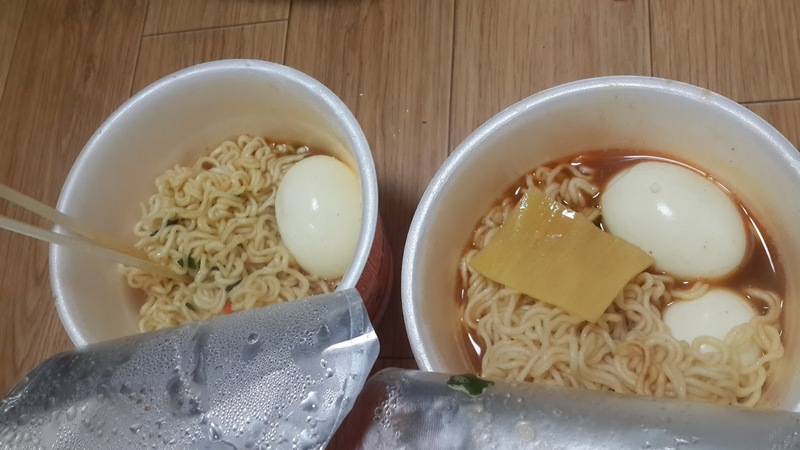 Whatever that also can put chicken meat or other meat in this ramen , actually I'm want put egg into this ramen but don't have egg so just put chicken meat about it . 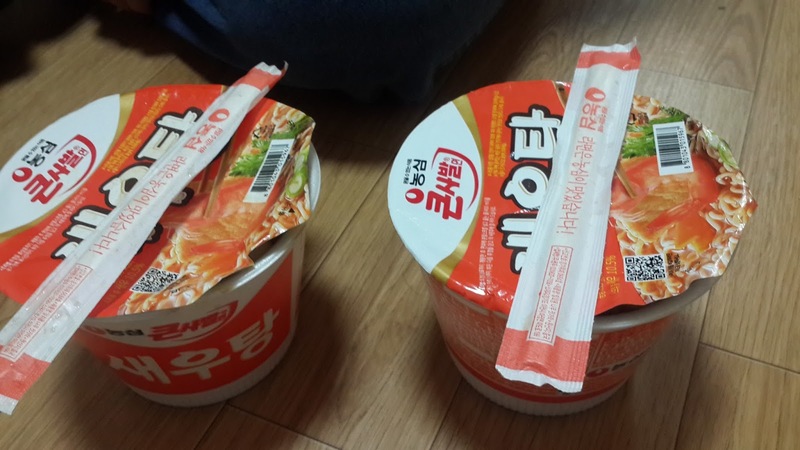 This also looking delicious about it too and that ramen sauce will be so delicious it , that don't salted too . For me about this ramen at here not expensive , so no problem want to eat everyday because this not bad for health and not same like other noodle we eat everyday in this life . 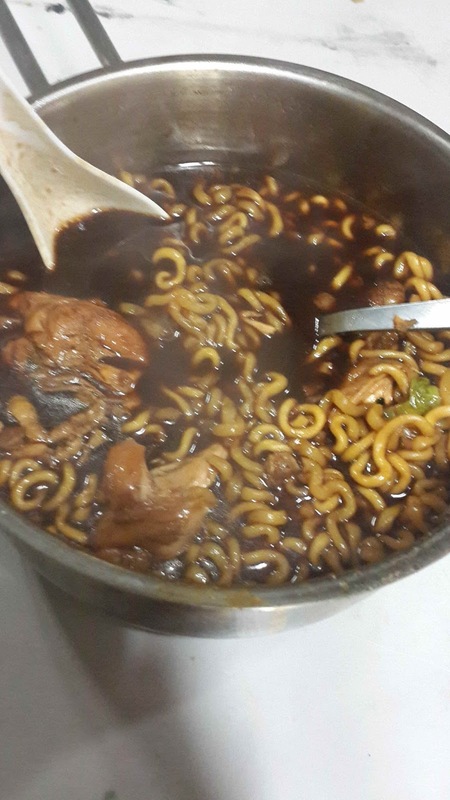 Maybe I'm and my wife will be bring bit this ramen back to Malaysia because this looking not expensive about it , So I'm will give thumb up about this Korean Ramen and I'm like to eat this ramen about it because that not bad for health . So if you want to know what is different about this ramen , that must be to try about it , this will be make you want be to try it for second time again . 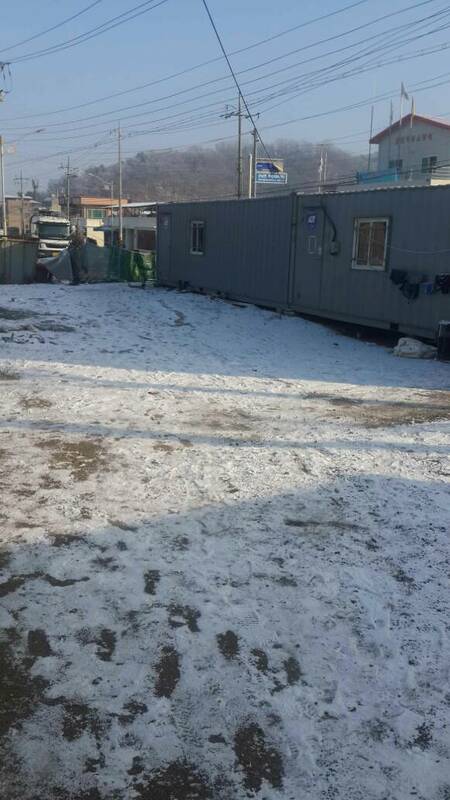 Weather today at South Korea already -7°C , that will be looking so chilled about it during day and night . 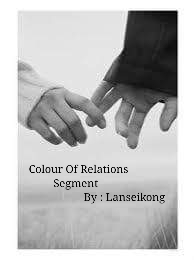 About the weather report at here this week will be falling snow about it , that will be looking great about it , about me be starting feeling unwell at here maybe about this chilled weather , when during night want to sleep must be using blanket about it . Maybe tomorrow that Celsius will be get -10°C so that looking more chilled it again , so must be prepared Snow Jacket and another things before start falling snow soon it . 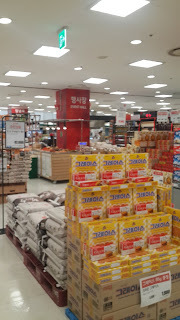 Maybe someone got eat " Pak Chai " about it , but in South Korea also got this but that called " Korea Pak Chai " , that is more interesting about this vegetable because this different it and just only in cold place in Asia . About interesting with this vegetable is large then " Malaysia Pak Chai " , about " Malaysia Pak Chai " is small it . 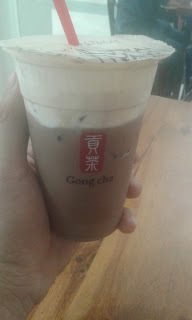 So must be try this " Korea Pak Chai " went visit this country and will be know what different it too . 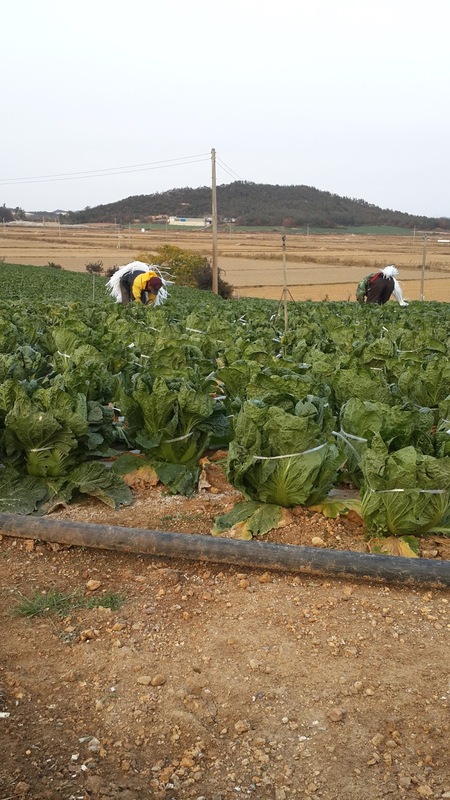 About this " Korea Pak Chai " also delicious to make with soup too and that can be nice when during Winter it , about this farm also looking so largest at here and everywhere can be see this vegetable too . 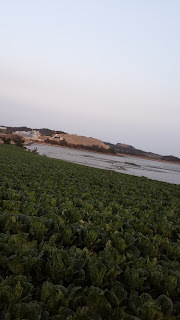 So that can say is a popular food in this country about it and this farm actually arrange by foreign owner from China with they workers about it , that is looking amazing it when see they workers to farming in this " Korea Pak Chai " farm with so fast it , that also looking excellent it how many farmer from China can be finish it this largest farm everyday without feel tired about it . Whatever for me maybe can't be do it fastest about it , because that looking not easy when to farming in this largest " Korea Pak Chai " about it and why this " Korea Pak Chai " is looking will be expensive when to import at another country about it . 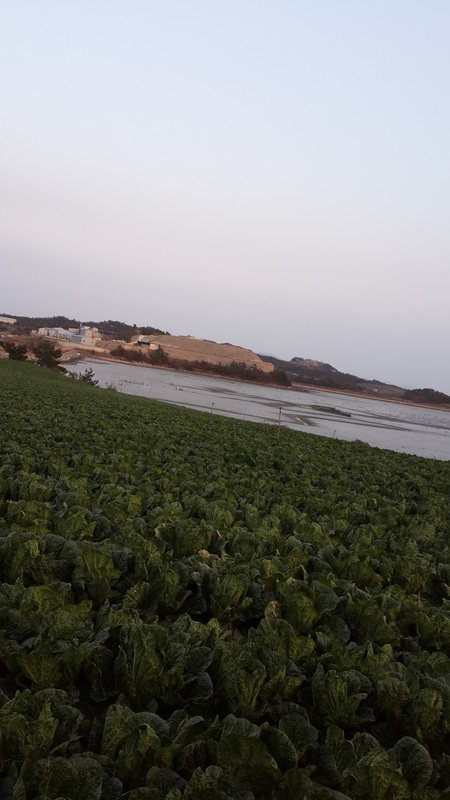 That also got another farm at in this country like " Long Carbbage " farm with not far too from this area too , about " Long Cabbage " is a how to make popular culture Korean Foods , that is Kimchi . 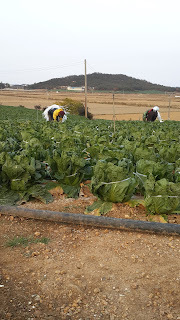 Maybe next time I'm will be visit this farm too if got a chance soon and that will be know how to farming about this " Long Cabbage " too . That is first time I'm and my wife travel to South Korea , this is very beautiful city and clean it about that weather is looking so chilled it during day and night . Whatever this is us both first time experince about that so very meaningful in this life about it , many things our both to learn at here about culture it , so this amazing about it . 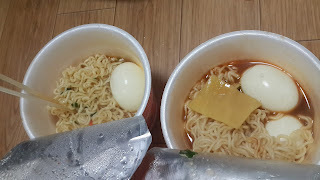 Our both at here first day already got try that pure Korean Noodle Cup that is looking so delicious about it too , that different then another noodles about it . So when visit this country must be try it too , actually they country always support they own product too , that excellent about it . When during chilled weather too is nice to take a hot meal too , because that can warm inside this body it . 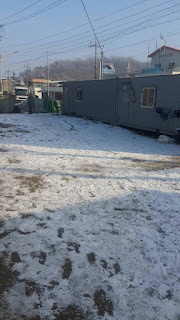 Actually now is already starting is Winter at here , so all citizen at here will be prepared hot meal or drink beer for warm this body , about me and my wife also follow it because that really chilled at here and this celcius is 9°C during day and night , but not yet falling snow at here . 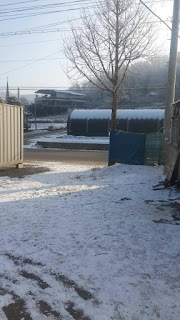 This also first time I'm and my wife got feel Winter in South Korea . About every house at here got Floor Heater it , because this can watm inside every house when during chilled it . That is feel amazing it , so that can't be feel cold inside this house when use Floor Heater about this and always keep warm inside whole about this house . So that is how creative about this Korean people for their house about it , About entertainment , they focus local movie about it and can say 90 percent is a Korean Movie and Drama , so this interesting about it , however if want stay long at here also can take a Korean Language Class too , that is easy want be communication it , about me maybe one day also will be this course too .
" OUR STORY DADIE "
Today I'm and my wife go to test some street food at near housing area about it , that is looking so delicious about this street food it and no wonder many people will be find this street food stall at here . Whatever my wife order dessert that is name Ice Blended ABC and other is Cheese Fried Kuew Tiew . What is different about this cheese fried kuew teow ? Actually this is got cheese topping about it and looking be delicious and make be mouthwatering about it . 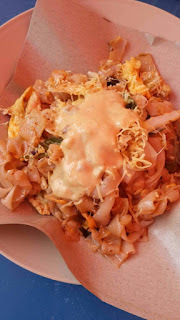 Normally this is first time try this and when eat that will be full aroma cheese in this fried kuew teow , so that must be try it about this street food . That price also not expensive with just only RM 8.50 for one plate . About that ice blended ABC is also nice it when during hot weather , must be find it for chilled that brains . This also not too sweeted about this and can pour extra Gula Melaka in this dessert by yourself , if when don't feel sweeted about it . 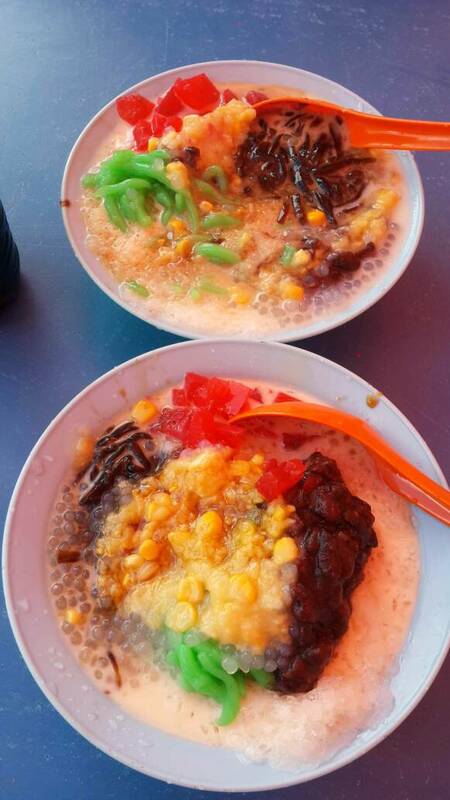 That price about this ice blended ABC just only RM 5.50 for one bowl it , whatever this looking so excellent about this street food . There also got sell Pisang Goreng and other Kuih-Muih , but my wife don't have order it , so can't be snap that picture about it . Actually about this street food is a food from heaven , that got many choice can be to choose it . So can be bring your family or friends can be stay here and try this street food , that will be never disappointed about it too . 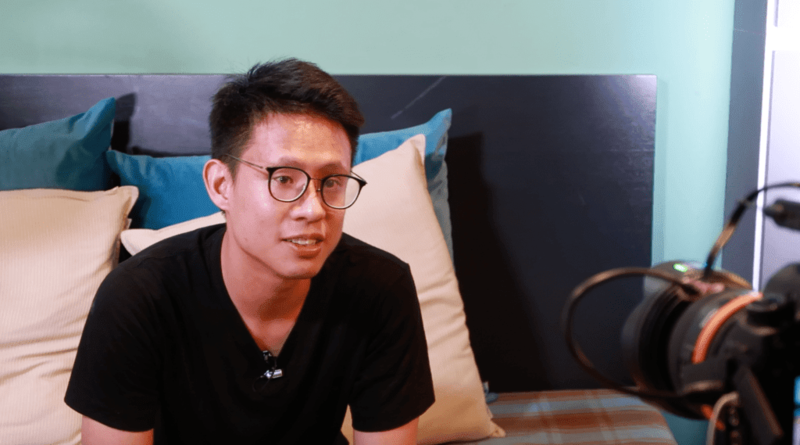 What is interest about in Penang ? Actually that is more delight cuisine from Penang will be all to known it , this also us culture dining of new place for all . 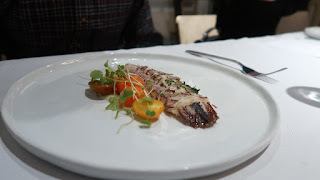 Whatever this is looking unique with gourmet discovery about it , whatever about Dinesaur got they talent Chef Johnson Wong with his experience in the kitchen to extend the best if the world cuisine . 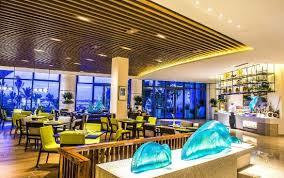 Now his in Penang with skillful in experience foods with how to preparation excellent cuisine it . Many customers will be liked what Chef Johnson Wong with brought to all table that night , normally this ingredients are handpicked by the chef to presentation of classic fine-dine dishes about it . 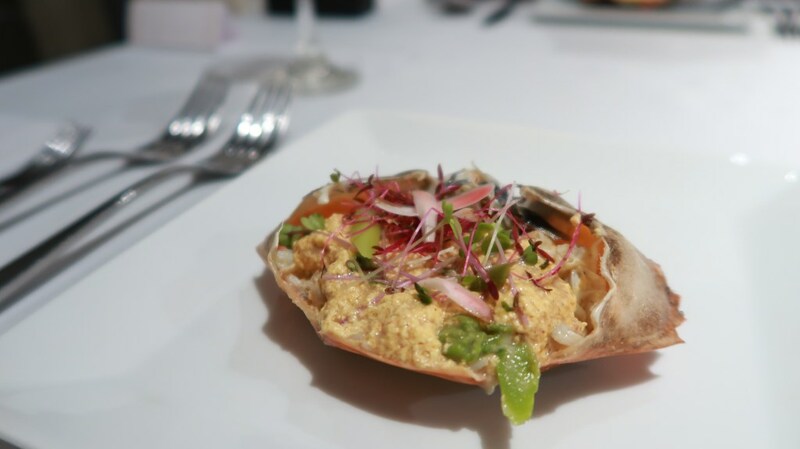 His prepared almost poplar cuisine at there like " slipper lobster " and " mud crab " about it , so that looking simple but will be make mouthwatering with this cuisine . that also can choose your favourite wine to pair with your dinner too . Youtiao As Known " Oil-Fried Devil "
In Chinese food got one popular food , that must be Chinese Cruller or as known Yaw Char Kwai or Youtiao . Actually this is long golden-brown deep fried stripe and almost popular it , that also can be torn lenghtwise in two . Normally this eaten at breakfast with porridge or dip into drink like coffee it , that also normally is China and Southeast Asian cuisines . Actually at breakfast this chinese cruller can be stuffed inside Roasted Flatedbread or as known too Shaobing , about this youtiao also can be wrapped with Noodle Roll , that is known Zhaliang . 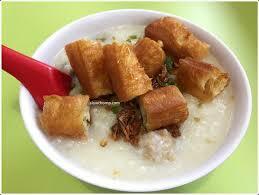 Youtiao is also important ingredient popular food in Shanghai cuisine that is known Cifan Tuan . Whenever Yaw Char Kwai in Cantonese speaking area , that is means " ghost " or " devil " about it , so as known " oil-fried devil " about it . That also got folk etymology about this chinese cruller , normally this is eaten as done to be traitorous couple , that is about it Qin Hui and his wife both have hand collaborating with enemy to bring for general demise it and so this legend still keeping it . 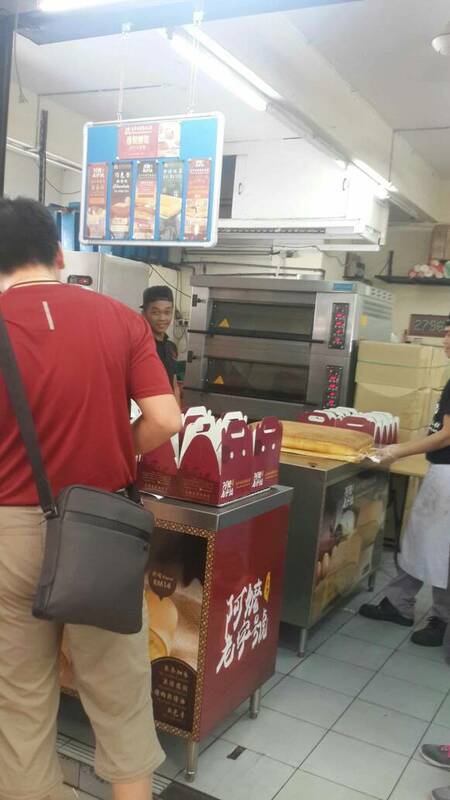 About his youtiao is often to make as two with a foot-long roll respresting the husband and the other the wife . 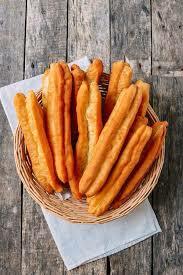 so this popular fried dough foods is can make many type about it for breakfast or tea-time too . About in Indonesia this is known as " cakwe " commonly chopped or sliced eaten with Bubur Ayam at breakfast , however that also can accompaniment with sate sauce too . About in Laos this youtiao is known " chao quay " and commonly eaten with coffee at breakfast . About in Malaysia , this fried doug will be called " cakoi " , that is filling egg jam Kaya or butter it and normally sold in morning street market or " pasar malam " it . In 1981 got a largest Philippines fishing trawler sunks lies under the sea in Labuan , this history still keep alive until now . This fishing trawler is named Mabini Padre with got fire and sunk lies under the sea about it , so this popular called it Blue Water Wreck , because that water there so clear it , that is already 36 years about this body wreck under the sea . 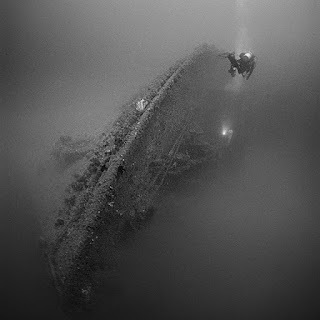 Whatever who go to diving at there and will be see this Mabini Padre with a great history , that not far from Labuan with just only 34 KM about it and Northest of Kuraman Island . 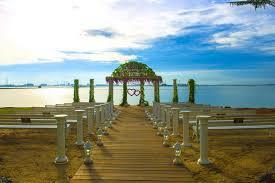 First time I'm here know Forest City in Malaysia , that is locations at Gelang Patah , Johor . That is feel so amazing about this beautiful destination for holiday about , actually I'm know that since about this beautiful destination after attend The Signature Food Fest 2017 at here Grandis Hotel And Resorts , Kota Kinabalu . I'm feel excited about want more information about this Forest City , so I'm get more information with find at Google about it . That its more interesting about this Forest City , when I'm see that all picture about this how most beautiful and amazing it , make my heart want to go there for holiday coming soon . That is really be a most wonderful too in the world , so I'm many people will be know about since this amazing beautiful Forest City . 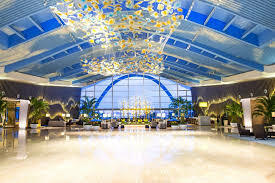 That is more interesting too about that Phoneix Hotel , because that interior design is looking so excellent about it , that so different then another resort in Malaysia . So that its nice choose this destination fir holiday about it , if who want honeymoon too can be choose about it with many beautiful view at around this Forest City , that is really must be visiting this place and don't let's that chance gone . That outdoors also looking so beautiful with many creative things can be see it and also take photo about it , when I'm this picture at google really want visiting this Forest City and how too know can be blogging LIVE from there with take many picture in this amazing place , maybe not today but coming soon about it . In this anazing place too can be release tension with taking fresh air every morning about it too , about this beautiful destination will be get many tourist from any country to visit this Forest City .